did you wonder how someone could fit an entire name on the pathetic scrap of paper they handed to you explaining your condition, much less anything valuable on your disease? You probably had tons of questions. Like what the heck is it? What's it actually doing to your body? Are there things you can do to reverse the symptoms? Doctors these days are extremely busy and information like this is hard to get from them. Which is SUPER frustrating, considering you probably had to go through several of them to actually get your diagnosis in the first place. I feel you, as even though my doctor told me my hypothyroidism was “autoimmune in nature” I had no idea what that really even meant for 8 whole years! Unfortunately, that meant 8 years of my thyroid tissue continuing to be attacked by my body because I didn't understand that my autoimmune disease wasn't stopped by the medication he prescribed. He was just treating my symptoms and replacing the hormone I could no longer produce. Fortunately, I later learned that I could stop the disease activity and my thyroid tissue now rejoices, but in countless conversations I've had with friends and readers, I've learned that most doctors still aren't sharing this valuable information. That's why I bring you this free Autoimmune Disease 101 series. It's like the piece that was missing from your diagnosis doctor's visit where you wished you were passed off to someone who could actually TELL you what was going on with you and give you some options. Start with Part 1 below! Autoimmune disease is one of those misunderstood ailments where there's a lot of fear and confusion. Because mass media doesn't focus on it much (if ever – not sure I've ever seen an article on it on a big site), and because doctors don't give a ton of information out about it, you're left feeling kind of on your own and alone with your diagnosis. Autoimmune disease is a disease where your body produces antibodies that attack your own tissue. When there's a threat to our bodies, like a virus or bacteria, our immune systems ramp up in action to get rid of the threat. We then produce antibodies to “remember” these threats so that if it happens again, our immune system can attack even faster. Unfortunately, in the case of autoimmune disease, our immune system gets a bit confused and starts thinking our own tissue is a threat and attacks it. Typically the tissue being attacked is the kind of disease you're diagnosed with, so for example, Hashimoto's Thyroiditis is where the thyroid tissue is being attacked and rheumatoid arthritis is where the lining of the joints is attacked. In autoimmune disease, we produce what's called autoantibodies – or antibodies against self. There are over 140 known autoimmune diseases, with several more suspected to be autoimmune in nature as well. First, before I get into what causes it, I just want to state – don't beat yourself up over this. It is not “your fault” and you haven't done anything wrong to cause it. It happens to so many of us and while there are things we can do to help prevent it, chances are it would have caught up to you at some point in time anyway. So instead of wallowing in guilt or shame, let's focus on feeling better, shall we? The cause of autoimmune disease is actually 3-fold. There are 3 main ways you can get an autoimmune disease. 1.Genetics (but these don't necessarily point to the specific autoimmune disease you'll get. Family members often have different autoimmune diseases). 2. Environment/Toxins – have you been exposed to chemicals in your job or at home? Do you live in the Pacific Northwest? (<- it's suspected that the high rate of autoimmune disease in the Pacific Northwest is due to low levels of Vitamin D due to lack of sunlight) Have you gotten any of the extremely common viral or bacterial infections in your life (chicken pox and mono have been linked to autoimmune disease for example)? 3. Diet/Lifestyle: There are no particular foods that “cause” autoimmune disease, but sometimes certain foods can cause inflammation in the body (which occupies your immune system), or that can cause your immune system to have a response (again, occupying the immune system), that reduce your body's ability to regulate the immune system. In an ideal world, your body would get rid of autoantibodies that attack you, but when your immune system is already fighting 10930482 fires, it could care less about regulation. Not getting enough (or absorbing enough) vitamins and minerals for your immune system to work at its best also hinders this regulation. I totally forgot to mention two very important things in the first video, oops! 1. There is no known cure for autoimmune disease. Unfortunately, it's a lifelong ailment where once your body learns to attack itself, it always has the ability. However, there are ways of stopping your body from attacking itself, and I'll get into that in the other videos. 2. It is NOT contagious! You cannot get an autoimmune disease by kissing someone or if someone sneezes on you. It's totally an internal process that CANNOT be passed on to another person. Even though there are 50 million of us in the US with at least one autoimmune disease, the medical world hasn't really latched onto doing much to help prevent or treat autoimmune disease except with pharmaceuticals. It's a very lucrative business and I don't think you can open up a magazine or watch a tv show without at least one ad for a drug to help with one of these diseases. Sometimes these pharmaceuticals help with our symptoms and we go on our merry way, living life to its fullest. Other times, we either get side effects that are worse than the original symptoms themselves. Boo! Either way, chances are the medications you've been given only address the symptoms and NOT the underlying disease activity. Let me give you my own example: I was diagnosed with “hypothyroidism” in 2006. My doctor told me it was “autoimmune in nature” but that there was absolutely nothing that could be done other than me taking a medication, Levothyroxin. This drug would help with my symptoms and replace the hormone that my thyroid could no longer produce. For 8 years I struggled with having to get my dose constantly adjusted and feeling many of the same symptoms I had originally gone to the doctor for. Eventually, in 2014, I went to a functional medicine practitioner, learned I had an actual autoimmune disease, Hashimoto's Thyroiditis, and that my body had continued to attack my thyroid those 8 years. I promptly took measures (which I'll discuss in a later video) to stop the disease activity and my body from attacking the thyroid, and now I've been able to live a life symptom-free and my thyroid is remaining intact. A key takeaway from this though is medicine is NOT bad. I still need medicine every single day as my thyroid cannot produce enough hormone to keep me healthy. However, medicine is also not the ONLY thing I needed. I've always loved the analogy that It's kind of like filling a bucket with water while there are still holes in the bucket. The other key takeaway is to NOT rely on medicine alone for stopping your autoimmune disease. You might feel better for a while, but eventually, it'll catch up to you if you don't address the underlying root cause. After all this you might be wondering what you can do, other than medication, to feel better. The good news is that there is actually a lot we can do to help. For instance, if you're constantly exposed to chemicals at work, see if there are precautions you can take to avoid them. Maybe wear a mask, gloves, or see if you can get a transfer to a different department. If you live in the Pacific Northwest and are low on Vitamin D, look into light therapy lamps or Vitamin D supplementation (work with your doctor on this). And for everyone, there are 3 things you can do today (or tonight) to immediately start helping your autoimmune disease activity to start to quiet down and feel fewer symptoms. I know, I know… this is probably not what you wanted to hear. Unfortunately though, gluten sensitivity has been found in EVERY case of autoimmune disease where it has been studied. Gluten (a protein found in wheat, barley, rye, and triticale) is a tricky little beast too, maneuvering its way into our immune systems in several different ways. Because it's a foreign “invader”, our immune system ramps up for attack, decreases regulation of autoantibody creation, and increases activity (which means more attacking of our tissues). This doesn't mean that if you have an autoimmune disease that you necessarily have Celiac Disease either – scientists are now considering gluten sensitivity to be on a spectrum, with some people slightly sensitive all the way up to full-blown Celiac Disease being the most sensitive. It's important to note that if you've been tested for a gluten allergy/Celiac Disease and been found “clean”, most tests don't accurately indicate gluten sensitivity. Most tests are only for a small subset of the problematic proteins and not all that can cause issues. Chances are, you do have issues with gluten if you have an autoimmune disease. Yes, I know, another super popular suggestion here. We sure love our sugar. Yet, that's the problem! Sugar is one of the worst things we can be eating, and I know I'm not the first person to say that to you. In terms of autoimmune disease though, it really is one of the worst things. The reason for this is hormones. Hormones are something that ALL of us have, and they regulate all sorts of processes in our bodies, from when we get hungry to when we are stuffed, to when we should sleep and wake and for how long. When you get stressed? Hormones happen! When you see an adorable puppy with those big soulful eyes? Hormones! When you eat that salted caramel chocolate bar and feel that sugar rush? Hormones! There's no getting away from them, but unfortunately, sugar messes them up big time. Without getting into the nitty gritty scientific details, let's just say that most hormones are interconnected and if you eat too much sugar, it skews starts skewing your hormones starting with insulin and like a domino effect, can lead to not understanding when you're hungry, insomnia, adrenal fatigue, weight gain, and inflammation. It's not like sugar = autoimmune disease, but you can't start feeling better from autoimmune disease if you don't have all the other processes in your body working as they should (partially because the immune system is fighting all those other fires and not caring about regulation again). So removing or drastically cutting down on sugar will help things work like they should, and you most likely start feeling better just from that. For some of you, this is laughable as you're getting way MORE than this. Many autoimmune diseases cause us to sleep a lot more than the “normal” amount. This is OK and don't freak out at all if you're one of these people. It's just a sign your body needs more rest and recovery and as you start to work on your autoimmune disease recovery you should start to require less sleep. However, for those of you who get LESS than 7-9 hours of sleep…. I know it's tempting to use all that extra time to get work done, binge on Netflix, or play some video games, but it's really hurting you. It used to be believed that sleep was just wasted time, that we were just basically laying there “resting”. Scientific studies these days though are starting to find out that many of the CRITICAL processes our bodies need to survive and work optimally happen when we're asleep. Things like detoxification, rebalancing of minerals and vitamins, and – wait for it – regulation of the immune system, all happen while we're asleep. Bottom line, if you get enough sleep you give yourself a huge advantage on helping quell autoimmune disease activity and symptoms. And without it you're just playing Russian Roulette with your health. So what's next? If you're new to all this, it might be best to try these 3 things I mentioned above first for a while to get used to it and start feeling better. 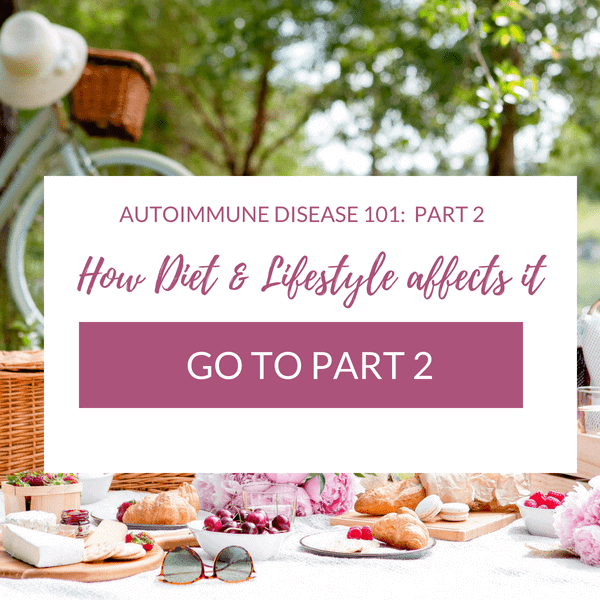 However, what you eat and how you live really do affect your autoimmune disease, so you can learn all about these important concepts in Part 2. Click on the image below to go to Part 2 – and/or download the Guide to Natural Autoimmune Relief to get a high-level overview of my diet and lifestyle recommendations.